Create extra fees for any additional services you need and display them on the checkout and shopping cart page. Use flexible conditions and advanced settings to clearly show relevant fees to customers and encourage them to spend more. Want to provide customers with additional paid services like gift wrapping, rush delivery or insurance? With the Magento 2 Extra Fee extension you'll be able to generate extra fees for any service you need. 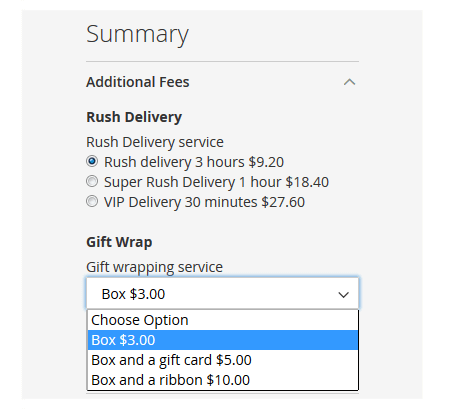 The module adds multiple extra fee blocks to checkout and cart pages to let store visitors choose necessary fee options before completing the purchase. Create percent or fixed price fees, choose different input types and display additional info for each extra fee block. Use flexible conditions to show fees based on payment and shipping methods as well as on products subselection and cart attributes. An admin user can specify which product price should be set as a base for percent fee calculation. It's possible to include or exclude shipping amount, discounts and any additional taxes applied to products when generating fee amount. This feature can be applied to all fees by default; it’s also possible to set custom calculation parameters for a certain rule. 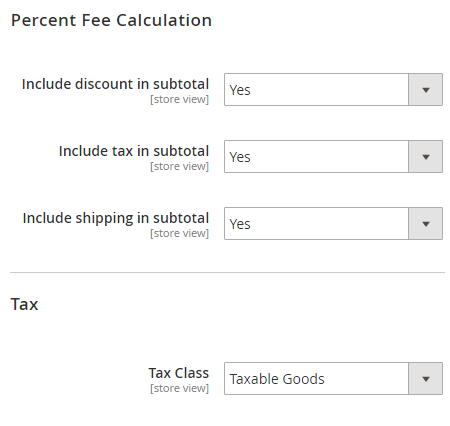 The Magento 2 Extra Fee module lets you choose either a percent or a fixed price type. Therefore you can set a flat amount tax like $15 as well as a specific percent from the cart subtotal. In case you choose a percent fee type the extension automatically calculates the specified percent for each fee option and displays calculation results to customers. Easily create various payment fees based on multiple conditions and condition combinations. 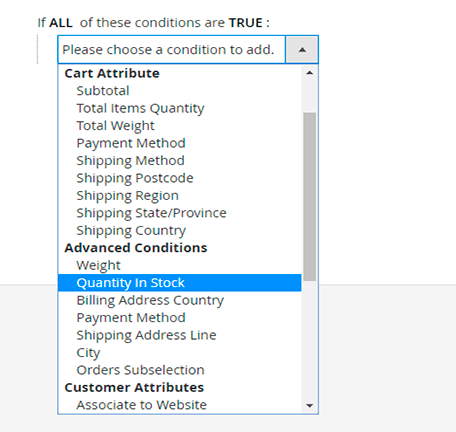 Use cart and product attributes to fine tune fees display according to your requirements. Charge special taxes for particular products (SKU condition), items from a specific category or with a specific attribute set etc. With the Magento 2 custom fee tool store owners can assign extra fees to any shipping or payment method they need. For instance, surcharge 5% for DHL Ground shipping method or add an extra fee for those customers who choose the 'cash on delivery' method. The module allows you to select store views and customer groups for which extra services with the corresponding taxes will be available. NOTE: You can translate fee options into different languages for each particular store view. Specify a default fee value while creating fee options in the admin panel. The chosen value will be automatically applied on the frontend pages unless a shopper selects another one. The Magento 2 extra charge extension lets you add the multiple fees blocks to cart, checkout and success pages to help customers easily apply the necessary option and immediately see the final sum including extra fees. Now you can also add extra fees to purchases created in the admin panel. This option is especially useful when a customer asks for additional services after the order has been applied. You can edit the already existed purchase and recalculate the final cost. Offering fast delivery is a trend now. With the module I can play with fees, groups and services the way I need. The feature I find particularly cool is corrections in the admin panel. This module is my savior. I sell hand-made natural stone jewelry so for me creating emotions is more important than just selling items. With this module I can conveniently charge fees for my master's services and custom packaging. Works fine, no issues. Our enterprise has various delivery options and additional services, we also have some taxes issues because of a specific location. The extension really helped us to set more flexible and actual checkout procedure and cart page.